Despite a year of terrible wildfires causing unimaginable loss, California’s 2 trillion dollar economy continues to churn, representing almost 14 percent of the U.S. economy and is the 5th largest economy in the world. Over the past four years, $78 billion in venture capital has been invested in California companies, which is more than five times the total of any other state.. Dealing with an economy this size is no simple task. The Governor’s Office of Business and Economic Development (GO-Biz) was created a few years ago to serve as California’s single point of contact for economic development and job creation efforts. GO-Biz offers a range of services to business owners including: attraction, retention and expansion services, site selection, permit streamlining, clearing of regulatory hurdles, small business assistance, international trade development and assistance with state government. The Innovation and Entrepreneurship department was created by GO-Biz to facilitate and promote innovation in the state of California. This department accomplishes their goals and visions through the Innovation Hub (iHub) Program which is cited as “the largest innovation network in the country.” In efforts to promote entrepreneurship, innovation and job creation, GO-Biz has partnered with California’s higher education system such as the University of California. Events are held on many UC campuses where speakers have the opportunity to speak about topics of their choice as it pertains to business and innovation. The quantities and diversity of agricultural products grown in California, including fresh fruits and vegetables, wine grapes, nuts and grains generate $47.1 billion in revenue. Many high-tech companies and small low-tech companies make their home in Southern California, in one of the largest manufacturing belts in the U.S. Five of the Top 25 Universities are in California. The manufacturing of electronic equipment, computers, machinery, transportation equipment and metal products has continued to increase. California also continues to be a major U.S. center for film, television and related entertainment industries, especially in Hollywood and Burbank. The CA Film and T.V. Tax Credit Program provides $330 million annually to encourage film and television production in the state. Tourism is an important source of income with Disneyland, other theme parks and cities like San Francisco drawing millions of visitors each year. California abounds in natural beauty, seen especially in its many national parks and forests. Located just 60 miles from two of the state’s largest seaports Just 60 miles north of Los Angeles, the Antelope Valley has been at the heart of aviation and aerospace since the dawn of powered flight. With its abundant sunshine, clear skies and aviators with The Right Stuff, both the military and the private sector have found this region to be an ideal location to build and test new flight technologies. First private spacecraft to win the X-Prize…plus many more. Home to Edwards Air Force Base, NASA Armstrong Flight Research Center, Mojave Air and Space Port, U.S. Air Force Plant 42, and the U.S. Navy’s Air Weapons Station at China Lake, the Greater Antelope Valley hosts every major aviation and aerospace prime contractor as well as hundreds of specialty subcontractors who make the complex parts and components to fulfill the industry need. The area’s workforce has extensive experience and deep knowledge of advanced materials, precision manufacturing and aircraft assembly. The region’s build and test facilities are unsurpassed with all the support systems in place to help turn around advanced projects quickly and quietly. Aviation and aerospace employs nearly 30,000 civilian and military personnel locally. Total local payroll tops One Billion annually. Contract spending adds nearly $600 million to the local economy. Nearly 20,000 indirect jobs have been created as a result of our aviation and aerospace industry. Overall, the industry has an economic impact that is fast approaching $3 billion annually. Come explore advanced aerospace capabilities along SoCal’s Leading Edge, just 60 miles north of Los Angeles! 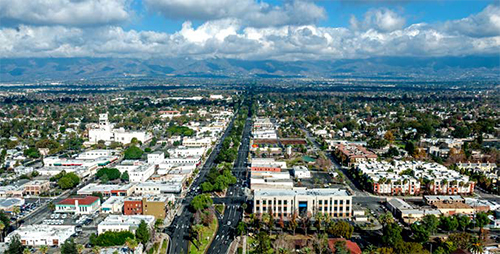 When people are looking to start or move a business to Irvine, it always starts with answering the question: Why Irvine? The answer began with the stunningly forward thinking vision that transformed 93,000 acres into an economic powerhouse and one of the most livable cities in the United States. Many know the story of the Irvine Company. The family who owned 93,000acres in what is now Orange County, and the company directors that followed, took a long view that this land and all those who would live and work on it, would be best served by a Master Plan that fostered the highest quality of life through preservation of “nonrenewable” assets and resources. They conceived of artfully designed neighborhoods and villages, acres of open space and livable neighborhood centers and regional centers that would support an economic powerhouse of Fortune 500 companies and robust, cutting edge industry clusters in the Life Sciences, Advanced Manufacturing, Information Technology and Digital Arts & Media just to name the top performers. The notion that a balance of “working, living, learning and recreational environments-all integrated in a logical and aesthetic fashion” was the core value that defined the design, its implementation and its sustainability. More than 50,000 acres of the original 93,000 acres have been preserved for parks, trails and natural open space. Spectacular office buildings rose in the Irvine Business Corridor. Beautifully manicured office parks attracted global companies. What would become global companies like Edwards Life Sciences and Allergan were born here. And world-class lifestyle, retail and entertainment complexes emerged attracting residents and visitors from around the world. Education, considered essential to a sustainable community, was and still is, a priority. Nearly every village in Irvine has a school associated with it. And with the addition of a now nationally recognized university, the University of California at Irvine 50 years ago, UCI, with its well-earned reputation for research and development and attracting a global student body, would grow side-by-side with the new City of Irvine. UCI’s new Institute for Innovation promises to greatly enhance an already strong start-up eco-system of hubs, collaborative work spaces, mentoring, capital, incubators and accelerators. Irvine is surrounded by rolling hills, city blocks of green space, sumptuous office park environments, fountains and parks sustained with award-winning water reclamation systems, Energy Star or LEED certified office buildings and beautifully manicured boulevards. Thoroughfares were built to manage and ease traffic congestion and reduce emissions. Six of the top twelve largest private companies in Orange County are headquartered in Irvine: Advantage Sales & Marketing, First Team Real Estate, Golden State Foods, Irvine Company, Fitness International and Vizio. Four out of five of the largest publicly traded companies in Orange County are located in Irvine: Allergan, Broadcom, Western Digital and Edwards Lifesciences. Our business community makes us stronger. Our public/ private partnerships empower us. Our diversity energizes us. Our quality of life inspires us. Our commitment to innovation in all things distinguishes us. And helping business grow motivates us. Halfway between Palm Springs and Sunset Strip, Moreno Valley rules the Inland Empire. The golden child of Southern California’s prodigious industrial boom, the Inland Empire is one of the fastest-growing regions in the nation, claiming the best portions of Riverside and San Bernardino Counties. Moreno Valley has carved quite a place for itself below the Great Basin, where property is as plentiful as the area’s vast resources, and compared to neighboring L.A. and Orange Counties, much more attractively priced. Spanning 51 square miles, the City is larger than Boston or San Francisco, and it’s got a lot more room. It’s also got a lot of reach. 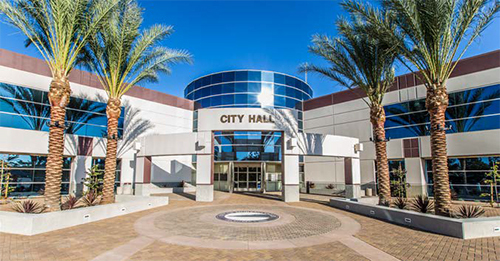 Incorporated in 1984, Moreno Valley is a young, bustling city of 212,000 residents, growing by five percent annually. With a beautiful backdrop and a storied Western past, it’s the second-largest city in Riverside County and 21st in California. According to rankings posted by The Fiscal Times, Moreno Valley is financially the third-strongest city in America, just 15 miles off Historic Route 66. The City’s vibrant landscape is lavish with yellow pine, chaparral, bighorn sheep and red-tail hawks. From town center, it’s an hour’s drive to the Pacific Ocean – or the alpine slopes of San Gorgonio, where chiseled artwork of the Shoshone, Serrano and Cahuilla preserve local Native history in prolific mountain stone. Almost 2.5 million residents live within the 20-mile trade area. 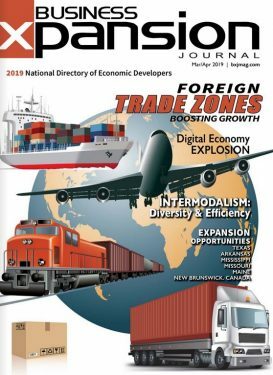 Networking with two of the nation’s busiest port systems, Moreno Valley has emerged as an international corporate mecca. The City’s strategic position within a Foreign Trade Zone provides huge tax breaks to businesses in global trading. Currently 4,500 companies operate locally, including major distribution centers for Amazon, Walgreens, Harbor Freight Tools and Lowe’s Home Improvement, and regional headquarters for ALDI, SKECHERS® USA and Solaris Paper®. Within a 50-mile radius, specialized training at 44 colleges and universities contributes to a highly educated, largely white-collar workforce. And recent expansions to Metrolink, Southern California’s public rail system, provide fast transit into Los Angeles. Over the last five years Moreno Valley has added more than 17,000 new jobs and 14 million square feet in corporate industrial space absorption – with another seven million under construction. Looming spectacularly on the horizon is the City’s World Logistics Center, a 2,600-acre corporate industrial campus that will invite more world-class international and Fortune 500 companies, while welcoming thousands of new jobs in advanced manufacturing, technology, healthcare, logistics and commercial development. The state-of-the-art facility will be the largest of its kind in California history. Unique among Moreno Valley’s corporate incentives are rebates for companies hiring locally, free recruiting assistance, and on-the-job training reimbursements. The City has also pioneered a fast-track concierge system to streamline new business construction, partnering with company representatives through every phase of the process. 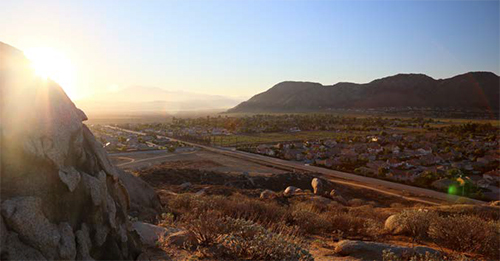 Moreno Valley clearly has found its perfect place in the world – with plenty of space to grow. It’s already made its mark, and branded it right on top of Box Springs Mountain: a luminous, larger-than-life letter “M” overlooking the town Hollywood-style, showcased in digital lights. Generous acreage at affordable prices, a thriving economy and incomparable natural beauty make Moreno Valley an ideal setting – and investment – for area newcomers. The City of Ontario, located in Southern California, continues to create development opportunities and urban lifestyle districts that provide sustainable places to live, work and play. Just 35 miles east of downtown Los Angeles, the City of Ontario is ideally situated as the gateway to Southern California. At the center of the City is the Ontario International Airport, which is the 15th busiest airport in the nation measured by air cargo. Major airlines including American, Delta, Frontier, JetBlue, United and Southwest, offer daily passenger service through the airport’s two busy terminals, and plans are in place to add a third terminal as traffic continues to increase. United Parcel Service (UPS) has their Western Regional Hub located at the Airport, which averages 38 planeloads of packages a day. Ontario offers a transportation corridor that extends throughout Southern California and across the continental United States and sits 45 miles from the two largest ports in the country. Ontario provides strategic access to the Ports of Los Angeles and Long Beach through its interconnected freeway and rail systems. Ontario also offers the advantage of being in the Foreign Trade Zone, which allows products to be stored, manipulated, manufactured, and exhibited without paying customs duties. The ability to increase international sales, realize greater export potential and succeed in global markets is often a deciding factor for location, relocation and expansion into Ontario. The mass of freight transport – via both rail and road – run through the City of Ontario. Three major interstates crisscross the City and the surrounding area: Interstate-15 from San Diego to Las Vegas and beyond; Interstate-10 from west coast to east coast; as well as State Route 60 for easy regional access. Ontario officials know the best way to attract business is by making it easy to do business. The City of Ontario has expanded by listening to business’ needs and constantly improving its environment to strengthen its competitive advantage in the marketplace. To find out more information about the advantages of doing business in Ontario, California visit ontariothinksbusiness.com or call 909.395.2005. Follow on twitter at @OntarioEDA. Its mailing address is very San Francisco Bay, but Vacaville feels like a much smaller town. Genuine, good natured, and true to its roots. Just one square mile in 1850 – the same year California joined the Union – the town made much of its small beginnings. Farming flourished in the rich soil of Vaca Valley; by century’s end Vacaville was the uncontested “Fresh Fruit Capital of the West,” gaining nationwide distribution aboard newly modern, refrigerated rail cars. Today local farms and two major fruit producers keep the growers’ market alive in Vacaville and surrounding Solano County, while the City continues to expand its holdings in core, high-end industrial fields: biotechnology, aviation, advanced manufacturing, logistics, healthcare, and food processing. Vacaville serves as a principal site for major pharmaceutical and biotech corporations, including Genentech, Janssen Pharmaceuticals, Kaiser Permanente, and RxD Nova. World-class aeronautics and biotechnical programs at Solano Community College keep these industries well fed with ready graduates. Career placement services led by Napa-Solano Building Trades Council and the County’s Workforce Development Board, along with advanced curricula at UC Davis, Sacramento State, Touro University and UC Berkeley, further augment the area’s vocational education opportunities. With ready access to San Francisco and the vast resources of California’s Central Valley, Vacaville has become one of the fastest-growing “small towns” in the nation, a tight-knit community of 100,000 – faithful supporters of art leagues, Scout troops, food drives, churches, and bake sales. Quaint and charming, Vacaville’s position in the North Bay is key to its enduring success. And unlike San Francisco, Vacaville still has plenty of room to grow… affordably. With three primary water sources and 1,000 shovel-ready acres, Vacaville is ready to build year-round. High on the current docket is the City’s “East Main District” plan for developing municipally owned parcels in the business district for mixed use, retail, restaurants, and housing. The Nut Tree, California’s (legendary) Road Stop, is Vacaville’s most famous landmark. Founded in 1921, The Nut Tree was a favorite stop on family trips to Lake Tahoe or San Francisco for a root beer or honey-glazed cookie. 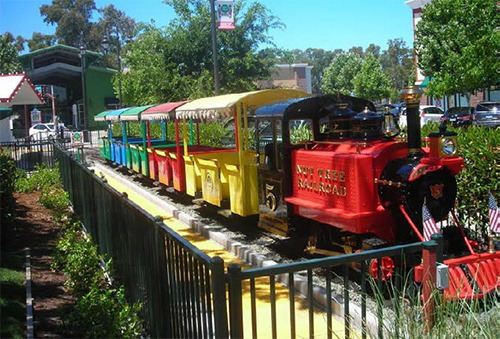 Nut Tree Railroad still runs today. Famous passengers have included Ronald Reagan, Bing Crosby, Shirley Temple Black, Max Baer and Bozo the Clown. ICON Aircraft recently transferred all its corporate operations to Vacaville. A leading manufacturer of airplanes and other aircraft, ICON will ultimately employ up to 4,500 workers. ICON was looking for a site to make great planes and teach people how to fly. They needed plenty of space and California sunshine, and Vacaville gave them the best of both.